Mark MacDonald told he looked fatigued and to take some time off. Chris Christoforou Jr. takes vacation for "personal" reasons. Trainers Anthony Montini, Jeff Gillis, Anthony Haughan, Kevin O’Reilly and Rick Zeron barred by Woodbine indefinitely. Horses trained by them can't be entered for 30 days. North Dakota betting hub suing NYRA. Owed 1.6 million for payoffs owed from wagering pools. Anthony Montini, Jeff Gillis and Anthony Haughan banned "temporarily"
*All odds subject to change without notice. Former Rideau Carleton track announcer Randy Rankin, shot dead. Brisbet's Ted Mudge really let David Willmot have it on a radio show last week. Willmot wasn't there, but his ears must still be burning. Mudge called Willmot a beggar, who without slots, would have driven Woodbine into the ground. Listen here, the attack happens at the 6 minute mark (But the entire interview with Mudge is well worth listening to). The point Mudge was addressing is Willmot's constant whining about other on-line gambling that is available, which he feels is hurting his corporations bottom line. What Willmot is denying, either wilfully or deceptively, is the fact that the horse racing gambling industry has been in trouble for ages, even before on-line poker, rebate sites, and exchange betting sites arrived. The younger generations did not replace the older generations loyalty and addictiveness to horse racing. The younger generations gamble, and even more so than before, but they do so on games of chance that have a much smaller takeout. younger crowd. WRONG. The way to get the younger crowd is to give the gambler a chance to win. Right now, the way the game is set up with it's ridiculously high takeouts and lack of marginal to bad handicappers adding to the pools, all that is left is backstretchers and knowledgable handicappers (who are too lazy to wake-up and open up a Betfair account or rebate account). To make things worse, with the slot explosion, the unsophisticated gamblers have put their gambling money to work on the one armed bandits and out of the horse racing betting pools. It is now sharks against sharks. Back in "the old days," if someone wanted to bet, they had to go to Vegas, or the track. In the 60's, a typical Woodbine or Greenwood card had 8 races, which included only one daily double, and one or two exactors. People left the track usually with at least some money most of the time. The 70's were the same, except more exotic bets were being introduced. Exactors showed up in most races, and then triactors appeared as well (this caused less people to leave the track with some money, but it was still OK) There was no simulcast wagering. You could only bet on horse racing 5 times a week, and there were only 40 to 50 races one could bet on. The crowds were large, and families would go to the track, because there was little competition, especially on weekends. The track takeouts were less significant, because it is much easier to leave a track a winner when you had a bankroll of say $100 to $200 and only had 8-10 races to play. People who leave the track with money, tend to want to come back and sometimes even bring friends next time. The way it is today is similar to blackjack. Except horse racing's takeout is equivalent to a blackjack game where the player would need an 18-21 to win even if the dealer goes bust and ties go to the house. If those were the blackjack rules, the tables would be close to empty, except for the Yahoos that just don't get it. Just look at Betfair. Even with a $6 minimum (actually it is much lower if you are booking a show bet), the action is great. With a $200 bankroll you can all day, and most likely have money left to play the next day, thanks to the low takeouts. Shutting down the competition won't work. Besides being unfeasible, players don't like guaranteed losses, so they won't go to the track regardless. Horse racing and football is much more fun to play than slots, blackjack, and poker for most gamblers, and it should be promoted as such. It is easy to make the horse race handicapping part less intimidating too. What is needed is a complete change in thinking by the entire industry. Change the track takeouts to 4-8 % everywhere. Embrace the idea of low takeout online exchange betting: The industry in North America should do it themselves, instead of letting a third party take a good chunk of the profits. The racetrack industry must understand that their customer has only a certain amount of money he or she can lose gambling during the course of the year. Eventually, they will get that money, no matter what the takeout is. And a lower takeout will attract many, many more players, and some will actually win. 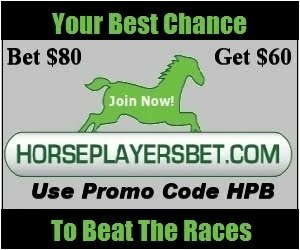 There is no better form of advertising than a professional handicapper who plays all day long and has his house paid for thanks to winning consistantly at the track. I can't believe Indy is 7 points. Normally, this would indicate the bookies are expecting Indy to blow out da Bears. Sure, the AFC was much tougher than the NFC, but a good defense usually beats a good offense in big games. The high point spread too is a head scratcher. Sungold announces it has acquired an exclusive license on patents for the first ever lottery to be based on actual live horse racing. Research of 11,000 players from 96 countries.